When Xavier Schlee was hired at Alaska Basic Industries 10 years ago, his boss told him he needed to learn to play golf. They went out for Schlee’s first round, having made a bet. If Schlee lost, he had to join the Associated General Contractors of Alaska entertainment committee. He didn’t win on the links. “Build Alaska” has two separate channels: “Legacy” and “Works.” “Build Alaska: Legacy” features people who have been in the Alaska construction industry for years and talks about the changes throughout their experience; these interviews are typically long-form. “Build Alaska: Works” highlights an individual in a skilled labor position and provides an overview of a specific trade; these are shorter, about 15 minutes. From traffic control supervisors to an aggregate manager, Build Alaska has interviewed a variety of individuals in the construction industry. AGC has even digitized some interviews that were originally done on film, including former Gov. Wally Hickel. Forrest Dunbar, an Anchorage Assembly Chairman representing Anchorage’s East District, was featured on the podcast in 2016. 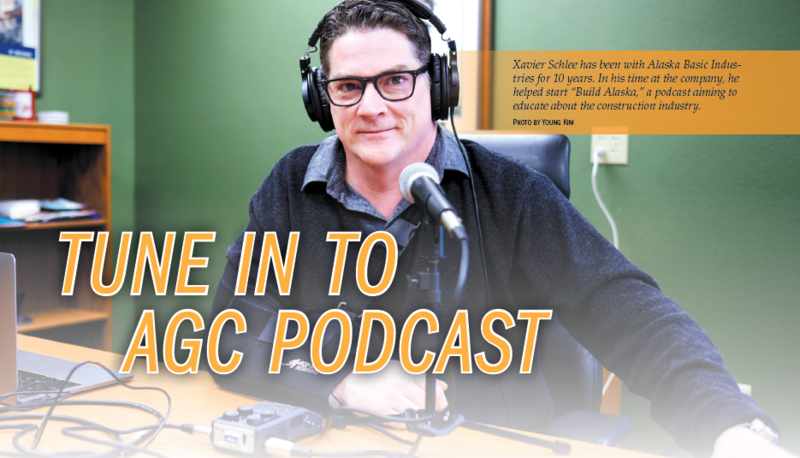 Schlee says that the original idea for the podcast came from Kimberley Gray and Lauren Sharrock, the events and communications coordinator and membership coordinator of AGC. After Gray and Sharrock initially proposed the idea, everyone came on board. Now, the team consists of Gray, Sharrock, Bronson Frye, Ron Pichler, Elisa Hitchcock, Mike Harned and Dominic Scalise, who help with interviewing, editing and everything in between. Schlee said the team now needs two separate sets of equipment to interview as many people as possible. The Alaska Contractor sat down with Schlee and talked about where “Build Alaska” started and where it’s going. Q: How did the podcast get started? A: When I first got started, I bought some equipment and fooled with it. My kids (were born) in 2000. ... The idea for that was, I would talk to my family about these events that were super important in their lives — one of them came out (as gay), another one was when their parents died — so my kids would have these things they could listen to. I started out doing that, and then this was much more formal. By the time we had gotten around to (the podcast), the equipment had become better. Q: How do you find your podcast subjects? A: You interview someone, and they’re like, “Oh, you need to talk to this person.” That’s kind of the greatest thing about it is that you, as an interviewer, can meet all these people who are super passionate about what they do, or they are the example of like, a mixer truck driver. “This is our best mixer truck driver.” So you get to meet this guy who has been doing this job forever and talk to him about this thing that they’re very passionate about. You meet really interesting people doing this as well. Q: What is the most difficult aspect of making a podcast? A: The difficult thing for me is on the “Alaska Works” (episodes) — the ones that I’m trying to keep in 15 minutes — is keeping them within 15 minutes. I don’t want to do a lot of editing, I don’t want to force my editor to cut a lot of stuff out, but people become so comfortable so quickly that it’s just a conversation, you know? Q: What has the response been like from the community? A: The Legacy (episodes), where I interview someone who’s been in the construction industry or someone interviews someone in the construction industry for whatever it’s been, 35, 40 years — the guy whose desk was next to me, that guy right there in the picture, that’s Earl Pollen. He started working at this company the year I was born. He died just a couple years ago, and I never got a chance to interview him. My idea was once people get over being freaked out by the microphone, it’s just a conversation. I love the idea that you could interview some of these people, their kids could go back and listen to it years later. They could see, “Oh, this guy that was just my dad was super respected in his community and did all these things that were important for the construction industry in Alaska.” That’s what got me started on those interviews. Samantha Davenport is a freelance writer living in Anchorage.